One Day Itinerary in Ninh Binh – From Breakfast to Dinner and a Massage! With everything from beautiful natural scenery to historical and religious sites, Ninh Binh is a must-see travel destination in northern Vietnam. Only 100 kilometers away from Hanoi, Ninh Binh is a tranquil province and home to many attractive travel destinations such as Tam Coc – Bich Dong, Cuc Phuong National Park, Thung Nham Bird Garden, Hoa Lu Ancient Citadel, Phat Diem Cathedral, and more. You probably want to see it all but spending long days in Ninh Binh isn’t always an option. Which highlights should you explore if you only have one day here? From my experience and the collected advice from those who have visited Ninh Binh, this article provides the most amazing one-day itinerary. Dawn has broken over the city. It’s time to wake up and start your new day in Ninh Binh. First, jump start your day by eating grilled Kebab rice noodle (bun cha quat) for breakfast. This noodle soup is very special. A large piece of pork is grilled over the barbecue. Often times, a bowl of noodles will feature small pieces of pork. The pork is marinated, grilled with noodles, and topped with sweet and sour fish sauce. 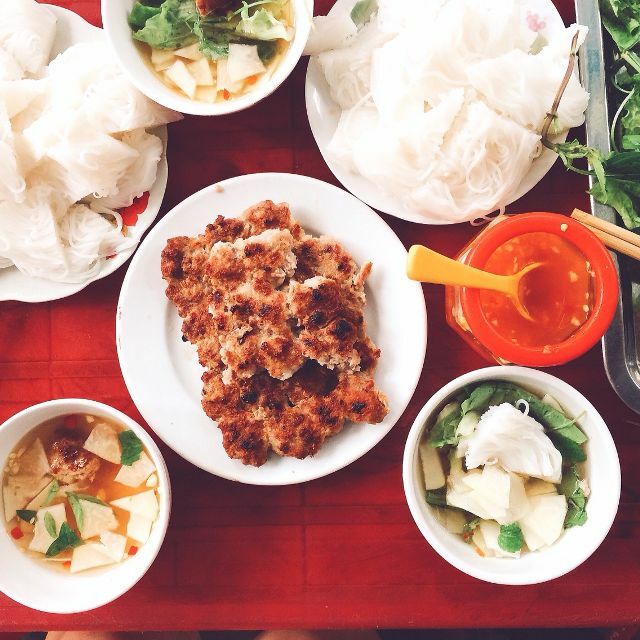 Tinh Mai restaurant is the most famous place to try bun cha quat in Ninh Binh. After enjoying a delicious breakfast, you will have enough energy for your day in Ninh Binh. Let’s start with Tam Coc Bich Dong. Tam Coc – Bich Dong, also known as Ha Long Bay on land, is the main tourist destination in Ninh Binh. This area includes a system of limestone caves and historical relics related to the Tran dynasty. Truong An – Tam Coc complex has been classified as a World Heritage Site by UNESCO. Tam Coc, meaning three caves, includes Ca, Hai, and Ba cave. All three caves are formed by Ngo Dong River that has pierced through the mountains. Tam Coc offers the first travel route to operate in Tam Coc – Bich Dong. To visit Tam Coc, visitors get on the boat at the central station. Local people row the boat on Ngo Dong River through the cliffs, caves and rice fields, which takes two hours. When crossing through the caves, the air becomes cool, the noises become silent, and many stalactites hang down like glossy teeth. 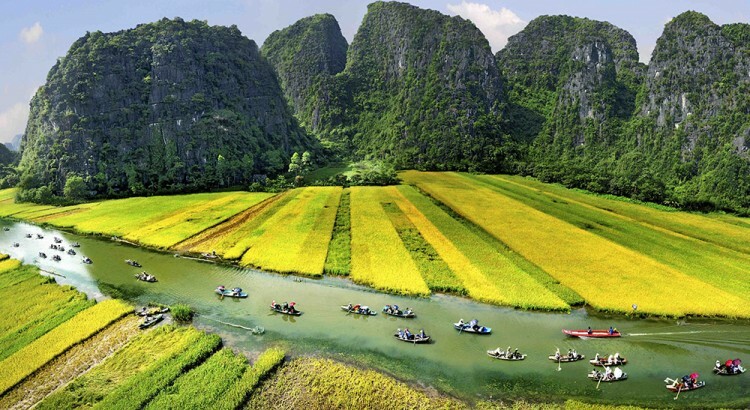 The scenery of Tam Coc, especially on the two sides of the Ngo Dong River, change according to the rice season (green rice, yellow rice, or silver water in the field). Bich Dong Pagoda was built in 1428, at the beginning of the Le Dynasty. The pagoda is located in Truong Yen lime mountain, Ninh Hai commune, Hoa Lu district, Ninh Binh province. At first, Bich Dong Pagoda was named Bach Ngoc Thach Son Dong, meaning the stone pagoda is beautiful and white as the pearl in the remote mountain area. Bich Dong Pagoda is comprised of three pagodas including Ha, Trung, and Thuong pagoda. Ha pagoda is located at the foot of the mountain. Climb 120 stairs and you will get to Trung pagoda. Next, Thuong pagoda is located at the highest point, near the mountain peak. From Thuong pagoda, you can see five independent mountains facing Bich Dong Mountain, which look like five lotus flowers and is called Ngu Nhac Son. Bich Dong is a unique pagoda in Vietnam because no place has a location quite as special. If you stand near the pagoda, you can see the whole panorama of the mountains and lotus lake. Breathe in and feel the calmness of this place, maybe you’ll get a sense of why this landscape inspires worship. Not only famous for its beauty, Bich Dong is also known as the most sacred ancient temple in the ancient capital of Hoa Lu. Every year, thousands of local tourists come here to visit and pray at the pagoda. After an interesting morning, supplement your energy by having a big lunch. The scorched rice is deep fried until the grain of the rice becomes swollen, crispy, and yellow. The specialty of this dish is the sauce. 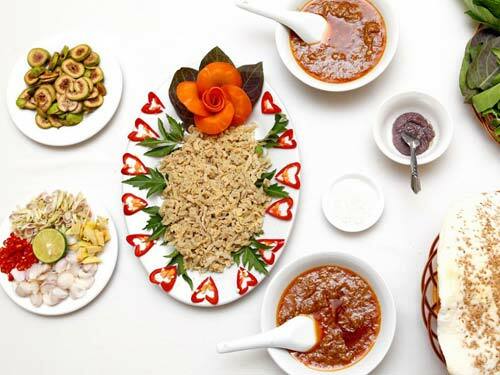 Sauces are made from different ingredients such as goat meat, beef, pork heart, and kidney. It is then fried with celery, onion, tomatoes, carrots, mushrooms, garlic, and pepper. All the ingredients are combined together which create a special taste. The goats are fed on the mountain, eat grass and medicinal plants, so their meat has excellent taste. This culinary combination of goat meat and scorched rice is the specialty of this land. Nho Quan wine (ruou can) is another specialty of Ninh Binh. Drink Nho Quan wine while eating goat meat and you won’t be disappointed. Nho Quan wine is special because it is not made through distillation. Local people cook ground sticky rice, then mix it with yeast to incubate in a jar for three months. The best part is that you don’t drink Nho Quan wine in a glass or bowl, local people use bamboo stalks. Bamboo stalks are hollow inside and plugged directly into the jar to drink. You can enjoy these specialties of Ninh Binh at the famous restaurants below. After having a big lunch and taking a rest, continue your journey in Ninh Binh with Hang Mua. Hang Mua is located at the foot of mountain in an ecotourism community in Khe Dau Ha village, Ninh Xuan commune, Hoa Lu district, Ninh Binh province. 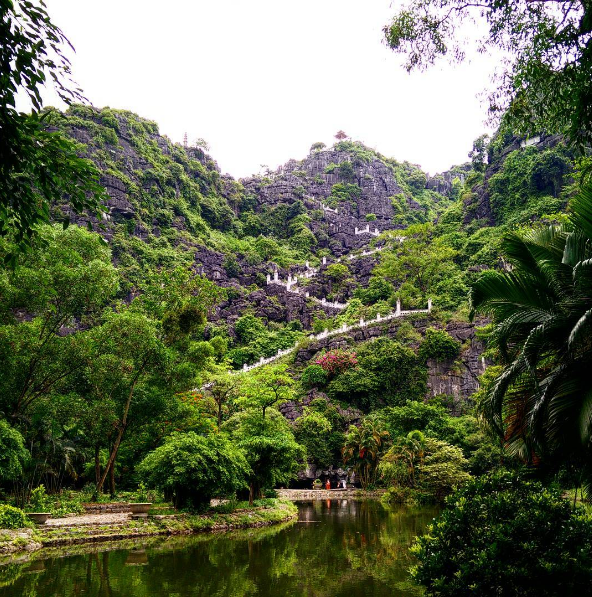 When you visit Hang Mua, challenge yourself by climbing to the top of the mountain on 486 stone stairs. The highlight of this stone staircase is its construction: built into the Great Wall. From the top of the mountain, the whole beauty of the Tam Coc area with the vast and green rice fields appear under your eyes. According to legend, Tran King often came here to hear the beautiful women singing and dancing when he returned to Hoa Lu. Therefore, this place is named Dance Cave, which means Hang Mua in Vietnamese. Your next stop is Phat Diem Cathedral, also known as Phat Diem Stone Church, the most beautiful Catholic church in Vietnam. 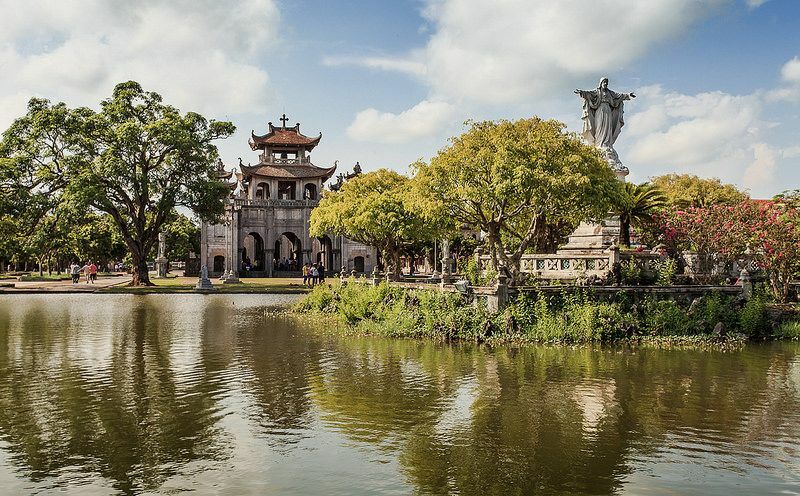 It is over 100 years old, built over 30 years entirely out of stone and limestone, and called the Catholic capital of Vietnam. Despite being a Catholic building, it is modeled after the traditional Vietnamese temple architecture with numerous arched roofs. The complex consists of a large church and five small churches (including a church built entirely of natural stone and known as a stone church), bell tower, lakes, and three artificial caves. In the past, the Phat Diem area was a sea raised by silt, so the foundation is quite weak. The laborers had to drive millions of bamboo stakes and thousands of new stone blocks to build a solid foundation for the cathedral. Over the past 100 years, the cathedral is still stable and preserved to the present day despite the impact of natural disasters and war. After a long day with many interesting travel sites, it’s time to find a stay, take a shower, then continue exploring the city at night. Ninh Binh has many luxury hotels and beautiful homestays, so you are spoilt for choice. Pick one suitable for your budget from the list below. 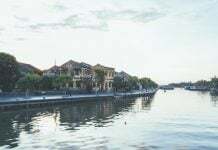 If you didn’t find what you’re looking for, check out our article on accommodation in Ninh Binh here. You must be really hungry now, right? Choose one of the delicious dishes below to fill the void. There are many delicious dishes cooked with snake eel but salad with snake eel is the most popular in Ninh Binh. After catching the snake eel, use lime, water, ash, and bamboo leaves to get rid of the mucus on the skin. Cut the back of snake eel to remove the bone. Then, cut it into pink slices. 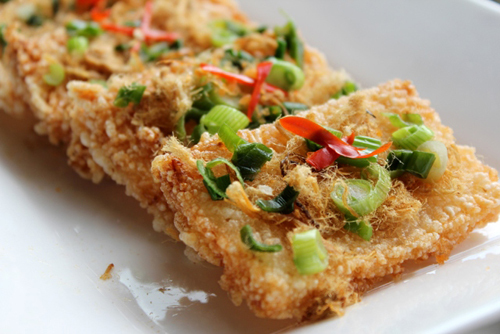 Mix the snake eel slices with thinh, made of roasted sticky rice to have a good flavor. Then take the deep-fried snake eel skin and roll it in with the slices and salad. The bone is ground to cook vinegar and then later used as dipping sauce. The vinegar is made with ginger, garlic, chili, pepper, and minced lemongrass. Another famous food of Ninh Binh is anabas noodle soup. Marinated anabas meat is cooked with water dropwort, bean sprouts, laksa leaves, and banana flower. Its sweet broth makes a perfect soup! Eat it with banh da and you won’t be disappointed. A massage is a great way to end a day of climbing. If you choose to stay at the Vancouver Hotel, get a massage without leaving the building. If not, there are many good places in Ninh Binh with good massage therapy and professional service. After a long day, it’s time to have a great sleep on the big and fluffy bed in your hotel. But that sounds kind of boring, doesn’t it? You still have a lot of energy and need to have more fun. Go for karaoke and sing until midnight! While traveling by yourself is fun, you might run into a few inconveniences. 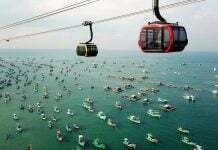 With a short time span of just one day, I recommend opting for a day tour option from Hanoi. 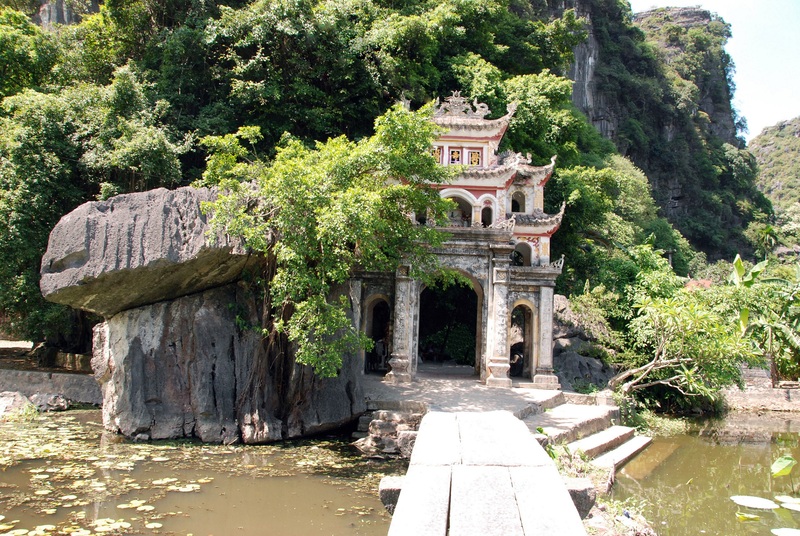 So to avoid all the tedious planning, check out the Ninh Binh Adventure with Onetrip. 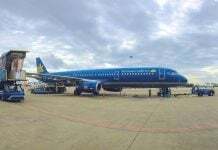 While all the places mentioned here are not terribly overrun by tourists, the Onetrip itinerary is quite special and you will be able to get up close and personal with the locals of the region. The guides are also knowledgeable and will make your trip exceptional. If this all sounds good, you can book on the Onetrip website. 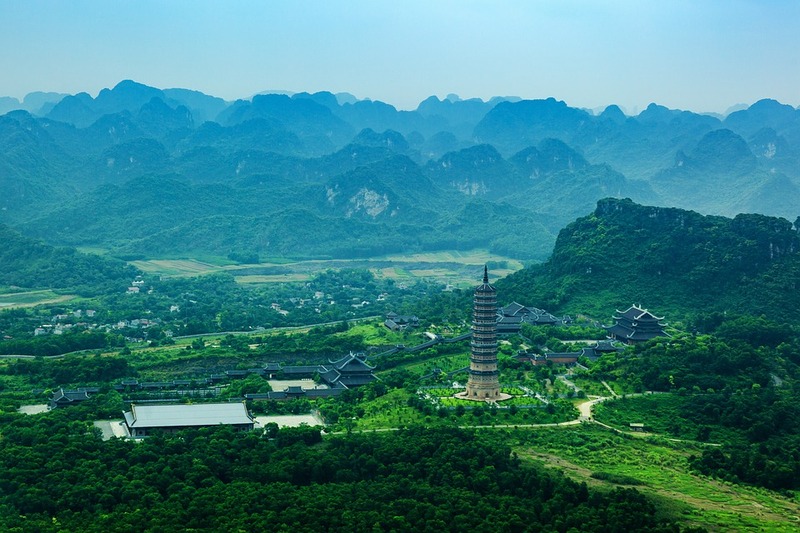 With all the information above, a great journey in Ninh Binh is within your reach. Keep reading other articles on our blogs if you are still eager to understand this land.